Home-infused vanilla almond milk creates a wonderfully spiced base for these Gingerbread Brandy Milk Punch cocktails. Along with brandy and coffee liqueur and you have something unique for entertaining which is also dairy-free and vegan. The bulk of the total recipe time represents the cooling/infusing time for the spiced milk. Combine the almond milk, ginger, cinnamon sticks, allspice, cloves and nutmeg in a small saucepan. Bring just to a boil and turn off heat. Allow to infuse until the mixture has totally cooled. Note: for even stronger flavor it can be transferred to the refrigerator to infuse for a few hours. Strain before using. 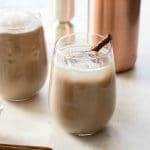 To make the Gingerbread Brandy Milk Punch: In a cocktail shaker or quart size Mason jar combine 8 ounces of the gingerbread milk, 1 ½ ounces brandy, ½ ounce coffee liqueur with a cup of ice. Shake vigorously and strain into am old fashioned glass filled with ice. Grate nutmeg on top and garnish with a cinnamon stick if desired.